It's always a pleasant surprise to come across an anime that isn't afraid to present itself in a way different than most others. More often than not an anime's narrative is linear, with a straightforward progression that is simple for mostly anyone to comprehend. While this method does result in well-written and engaging stories, it can take an extra level of skill to alter the way a narrative is told and pull it off correctly without any hiccups. Mekakucity Actors isn't interested in being your average, everyday anime; it's one of the few that seeks to challenge the conventions of storytelling. 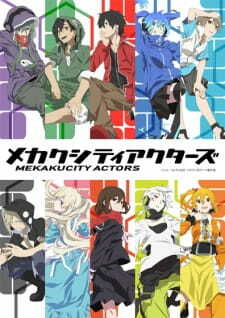 To give a bit of background, Mekakucity Actors is based on a series of Vocaloid songs which is known as the Kagerou Project. Created by the musician Jin, the series was an overwhelming success that went on to spawn manga and light novel adaptations. Its popularity could be contributed to its cast of diverse characters and songs that pieced together different perspectives out of order to form a complex and intriguing story. In the spirit of the project, the anime takes the same approach with its narrative. Unfortunately, the end result is a complete mess that comes off as a convoluted cluster of wasted potential. The setup for Mekakucity Actors is easy to grasp; a group of teenagers with superhuman eye abilities, collectively referred to as the Mekakushi-Dan (Blindfold Gang), is faced with mysterious occurrences and encounters that take place during August 14th and 15th. The main draw of the show is the fact that these incidents have a fair amount of depth that is kept hidden from the audience at first. You might think you have firm understanding of an event that transpires in one episode, but then the next episode will backtrack and reveal sides to the story from another viewpoint that changes how you perceive those events. When this technique is put into use, the results are relatively positive. In addition to the differing perspectives, we are also given episodes that are devoted to illustrating the back stories of the members of the Mekakushi-Dan. It's in these episodes where you'll come to realize the care that was put into their relationships, and how they tie everything together in unexpected ways. Connections between the characters begin to form and revelations are plentiful. It's enough to pique the viewer's curiosity, but it's also a distraction from the show's other shortcomings. At the same time, the story is definitely what I would point to as the factor that contributed the most to the downfall of Mekakucity Actors. To start off, a major flaw would be that the show lacks direction and focus. It could feel very much like an aimless slice of life at times; there were episodes when I wondered where exactly it was heading and if there was even an end goal in the first place. To make matters worse, the flashbacks interrupt current events way too often and steer the narrative far off course. Normally I'm perfectly fine with a show not having a definitive plot and instead focusing more on the characters, but the problem is that Mekakucity Actors does have a plot, it just does a really poor job of establishing that fact early on. There's even an antagonist that is working against the Mekakushi-Dan; too bad we only get vague hints about who it is up until the ninth episode. These elements are kept a secret on purpose, but are introduced too late into the game for any sort of personal investment to be formed. It doesn't help that the majority of the show will have you scratching your head in confusion; if anything it's more perplexing than engaging. While the anime adaptation doesn't require you to have prior knowledge of Kagerou Project to get the gist of what is happening on screen, it certainly isn't going to hold your hand to make sure you understand everything as a newcomer. There will be moments when the viewer will feel lost and question whether anything makes sense. This can hinder the emotional value one takes away from certain scenes, as they might be too busy trying to figure out the circumstances rather than focusing on the characters' plights. Mekakucity Actors tries its best to explain itself by the end, but some points don't come full circle and you're left to fend for yourself with what little information it gives you. Don't even expect a satisfactory ending, because not even that is provided. It turns out feeling rushed in order to very narrowly cover the remaining plot threads. It doesn't feel like there is enough of a payoff to make up for the frustration of trying to make heads or tails of what was going on for far longer than needed. While the muddled story is a massive strike against Mekakucity Actors, there are some redeeming qualities that can be found in its expansive cast of characters. One strength is that they serve a larger purpose; they aren't there just to fulfill the need for a specific archetype. They have importance in the relationships formed with the other members and these bonds greatly impact how the story unfolds. The richness in their personalities makes the banter and communication between them more enjoyable and even insightful occasionally. The characters also have a habit of betraying the viewer's expectations. For example, Shintarou Kisaragi is portrayed as the typical NEET who would rather stay secluded in his room than journey outside, but eventually you learn of an experience from his past that makes his mindset more believable. Another surprising case is with Kano, who is established as the playful, non-serious member of the Mekakushi-Dan. In contrast to first impressions, we get hints of a much more sinister side to his personality, as well as some personal struggles that he might be hiding from other people. At the start of Mekakucity Actors, I didn't think my perception of some characters would change so much. Give them a chance and you might even find your own personal favorite of the gang. That isn't to say the fundamental issues with Mekakucity Actors don't also affect the characters. In fact, they suffer a lot from the way the show is constructed. When it comes down to it, don't expect to see any significant development from the majority of the cast; they remain the same with only a few exceptions. While they are slightly memorable, I would hesitate to call any one of them more than mediocre. Some characters, such as Seto, are incredibly boring due to lack of any real exposure. The antagonist felt more like your typical villain than anything, and they had dull motives that didn't go anywhere interesting. It was regrettable that the eye powers are mostly pushed to the sidelines. Witnessing more of the Mekakushi-Dan's attempts to cope with their newly found powers would have given some much welcome insight. There are other weak links that could have easily been expanded upon, but due to time constraints they never saw the same treatment the others got. Also, the show has a habit of not putting enough focus on characters that are important to the plot. This is the case with Mary, who is an essential piece of the puzzle and yet she has one of the simplest personalities out of everyone; the sweet girl who is clumsy and shy. Another example would be the monster depicted in the storybook at the end of each episode. The book tells the past of a monster and how her life progresses when she discovers new things about the world. These segments are treated as mere afterthoughts by being pushed back to after the credits, when in reality they contain vital information that shouldn't be ignored. The handling of the characters is sloppy and unbalanced, which isn't surprising considering the short amount of episodes they had to work with. This was definitely the area that let me down the most, mostly because of the largest amount of potential was lost here. The animation for Mekakucity Actors was brought to us by the acclaimed Studio SHAFT, renowned for their distinct visual artistry and techniques. If you have ever experienced a SHAFT anime before, you already know what you'll be getting yourself into before you even watch the first episode; expect the usual head tilts, jump cuts, and slow camera pans. It's nothing groundbreaking, and feels very much like your typical SHAFT anime. I can't say anything positive about the animation, as it mostly felt average with some really low points that made the movements feel stiff and limited. There was also a time where SHAFT thought it would be a wonderful idea to have the characters animated using CG models during a scene that was supposed to be emotional, and the results were appalling to say the least. It had to be one of the worst uses of CG I've seen to date in an anime. It's clear that not a lot of care was put into the backgrounds either. They were almost direct copies of those found in the Monogatari series to the point where I wouldn't be able to tell the difference if two screenshots were shown beside each other. There are some moments where the imagery shines, but the bizarre feel is expected and far from impressive. The music of Mekakucity Actors is unremarkable for the most part. The soundtrack doesn't feel varied enough, and I would often notice the same song playing every episode. Nothing stood out, except some instances of dubstep that clashed with the mood certain scenes were trying to set up. The saving grace is the fact that the original songs from Kagerou Project are inserted into their corresponding episodes. Jin is a very talented musician and his skills become apparent through his meaningful lyrics and memorable melodies. The new arranges sung by professional vocal artists are a real treat to hear, especially for long time fans and people that aren't fond of the synthesized Vocaloid voices. The opening "daze" is a catchy and fast paced tune that made me excited to watch the upcoming episode. The ending "days" sung by Lia is mesmerizing, strikingly beautiful, and probably my favorite piece from the whole project. As for the vocal talents, the actors played their roles well and I had no complaints with any of them. They breathed life into the characters and did well at highlighting their personalities. Mekakucity Actors has more than its fair share of problems. It's plagued with a less than stellar story and characters that suffered as a result of poor pacing and lack of focus. But despite all of the flaws, I didn't find myself entirely hating the experience. It certainly achieved its goal of standing out from the rest this season, and that alone was enough to draw my attention and keep me coming back week after week. While I would be hesitant to recommend this to anyone due to its abundance of issues, I would say the other works in the Kagerou Project might still be worth your time. Starting with the songs would be ideal, followed by the light novels and manga for further clarification. Each offers its own twist on the story, and the experience can differ drastically from the anime; there was a lot of cut content that wasn't quite able to be squeezed in properly. It's a shame that the end product was a such disappointment, because Mekakucity Actors could have easily been something worthwhile. In the end, it was too ambitious for its own good. Upon skimming over the top 2 reviews for Mekakucity Actors, I went into this anime with rather mediocre expectations, considering as well that the average rating was below an 8. I had not heard or read anything about it otherwise. Usually the mark of a mediocre anime sports somewhat unnatural or clumsy dialogue, and mundane art or animation. As such, I expected to encounter either. To my pleasant surprise, I immediately sensed a heavy dose of SHAFT animation, so I knew that I would at least enjoy the animation to some extent. The dialogue wasn't horrible either. I pushed on expecting to be disappointed by a dip in quality. I think it's here that I'll begin to go into some details. Before I begin, I will state that I am a fan of SHAFT and that I did enjoy this anime, but I will obviously set aside any personal opinion and review this anime objectively. After completing the anime, I decided to go back and read through the reviews that had originally set my low expectations. I observed reoccurring negative comments; terms such as “confusing [and] convoluted story,” “lack of direction,” being thrown around in conjunction with “average [and] mediocre animation.” The latter of which afore-quoted reviewers obviously pinned on the animation style of SHAFT. This was rather surprising, as the animation is almost identical in style to the well acclaimed Bakemonogatari series, though slightly lower in quality. The story, although sagging under heavy accusations of being overly complicated, was definitely not as bad as I was led to believe. Before reading the reviews and diving into this anime, of course I read the synopsis that was offered, which, in all honesty, did not grab my attention. It sounded like the set up for another mediocre action-supernatural-possibly-adventure anime that probably would have some fight scenes and some friendship etc. After the second or third episode, though, that the synopsis and reviews gave off a completely incorrect vibe, and that I was clearly in for a slice of life anime. Anime, like movies, music, paintings, and pictures, has the potential to be a form of art and expression. This is often forgotten when most of the movies we see nowadays only intend to net as much money as possible, and most photographs we see are random advertisements, or impulsively posted pictures on Facebook. But when the creator wants to create art, he gives the work purpose. The work’s purpose may be a gift, or to tell a story. When it comes to movies, tv shows, and anime, generally the purpose is to send a message, or tell a story. Usually when someone says the word “story,” we think of a protagonist, a problem he encounters, a struggle, a climax, and a conclusion (this is oversimplified of course for the sake of argument). And when you go into an anime like Mekakucity Actors, having read the synopsis, surmising that it will take you on a solid, linear plot straight on into the horizon, to arrive at the ultimately conclusive and satisfying ending, standing atop the highest mountain with a fulfilling sense of accomplishment or what have you, then of course you will feel betrayed and confused. What sets the slice of life genre apart from the classic adventure is the way the story is based and presented. Of course the story is the main feature in an adventure anime, and the character travels through the story. In a slice of life, however, the thing you would call a story is slightly more abstract. The definition of the slice of life genre is, literally, something along the lines of an anime that depicts a part of a person’s life. And that’s exactly why if you were looking for a good story first, you will undoubtedly be let down. Slice of life isn’t about the story. Its about a person. It’s about people. This is also the reason slice of life anime often leaves us feeling unfulfilled yet full of feels, because it follows the characters, who are human. Instead of accepting that they are who they are, we get to feel the hardships they’ve been through, and in the end you’ve created a bond with each of these characters. In Mekakucity Actors, we start by focusing on two siblings that are lost and confused, possibly expecting that they will band together with Mekakushi Dan and fight some sort of evil. While in the end, that is what happens, that’s not the point of the anime. The point is that each of these youths never wanted this power; that they are struggling simply to live a normal life, and each of them has had painful things happen to them in the past. We even go as far as to follow every single character in their past, which is more telling as to the anime’s depth. In the first half you’ll probably pass off Shuuya as some joker who likes provoking people, and Ene as some annoying program, both of which you will not much care about in the beginning. As the anime progresses, however, you will undoubtedly learn that what each of these characters has been through isn’t something to be taken lightly, and in the end, you do care about them. That’s part of what makes Mekakucity Actors such a good anime. Saying this anime is mediocre because it has a complicated and difficult to follow storyline is like saying Shingeki no Kyoujin is bad because people die too much, or that Bakemonogatari is bad because it doesn’t really have a central plot. The difference between these is that because they are so well known, Bake and SNK are immensely popular, so generally people will watch these with a preconceived idea of what they’re getting, and they will not be disappointed. But it appears many of us watched Mekakucity Actors not knowing what to expect, and expected the wrong thing. Anime produced by SHAFT certainly has a different taste than anime from other corners of Japan, sometimes creating pieces that would deter a certain number of people. With plenty of stills and wide, slow panning shots, the head tilts, and strange frames, SHAFT’s style will definitely put those off who don’t enjoy or expect their animation style. I was mildly surprised to find complaints about the animation in the reviews, as we know Bakemonogatari’s iconic animation style had made a big impact in anime, yet this animation style is not accepted here? I realized it would have to be the same problem as people complaining about the story. SHAFT’s animation style is very suited to the comedy or slice of life genre. Still and wide shots aren’t very suited for action, and action is what you will not find in SHAFT anime. This brings me back to my earlier point about the story. Expecting an action/adventure/supernatural anime would lead you to expect a more active camera, and some faster paced animation. SHAFT’s animation was a perfect fit for the Bakemonogatari series. In an anime that very closely tracks unusual, supernatural occurrences and the emotional states of the characters, the subtly to extremely surreal settings which SHAFT creates allows the viewer to understand things without having exposition projectile-vomited at them. Our main character is driving down an endless highway with featureless scenery? Subconsciously adds to the impression that the scene is awkward and dragging on. Ice cream stand in the middle of what appears to be a desert with Joshua trees, even though they’re supposed to be in Japan? A less than subtle jab at how hot it is, and how much of a pain it is to walk in the sun. While the animation in Mekakucity Actors does not go to the same lengths to exaggerate as the animation in Bakemonogatari, the wide shots and still scenes will force you to slow down and absorb how the currently framed character perceives the world around him. After all, the anime is about students who’s pasts and powers set them apart from society. I will be honest, the animation, while good, was not the best it could have been, but I still appreciated many of the settings, especially the metaphorical classroom that Ayano waits alone in for Shintaro. I have only commented on two parts of the anime, and I think that’s enough. I thoroughly enjoyed the soundtrack as well, and to reiterate, I enjoyed this anime as a whole. Generally I’m not driven to review anime, but when it so happens that an anime I not only enjoyed, but one I believe is objectively better than other reviews might have you believe, then of course I had to say something. Being late to the party, I don’t expect many to read this, but at least I can rest easy knowing my word is out. Mekakucity Actors was definitely among the most anticipated anime this spring season gone past. With an already well-established fanbase, an intriguing premises, and animation done by none other than SHAFT (Puella Magi Madoka Magica, the Monogatari Series), the series garnered a lot of attention from the anime community. Not only that, but the creator of the Kagerou Project (the vocaloid song series from which this anime is based), Jin, also had input into sculpting the series. However, after finishing the final episode, I can summarize my feelings towards the series as a whole with one word: disappointing. This is undoubtedly the major fault of the show. The story of Mekakucity Actors is fairly simple: it explores the events that occur around the group known as Mekakushi-Dan. The people within this group all posses mysterious eye powers, and they were all brought together due to the incidents that occurred on August 14th and 15th. So much could have been done with this premises, however, SHAFT handled it poorly, to say the least. The way the story is portrayed is far from conventional storytelling. Each episode usually focuses on a particular event or character. The information given to us is then tied into the events of the next episode, meaning that when viewing an episode, it may be slightly difficult to understand what is going on. While I am all for innovative methods of storytelling, Mekakucity Actors simply did not have enough time to use this, focusing too much or too little on certain elements which result in some episodes feeling rushed. Also, SHAFT decided to throw in some metaphorical imagery, which may make things even more confusing for the viewer as they are already trying to understand what the hell is going on. With something with so much potential, it was saddening to see it get butchered in such a fashion. Something else Mekakucity Actors didn't handle very well. It's not to say the characters weren't likeable and enjoyable to watch: believe me, they were. However, the show had this tendency to focus less on the characters who were imperative to the story, or completely ignore others. For example, SHAFT dedicated an entire episode to Momo, possibly the most unimportant character in the series, while only really addressing more important characters, i.e. Marry, at the very end of the series. Also certain characters *cough* Seto *cough* had so little screen time that they might as well have been superfluous side characters. In terms of character development, the majority of the cast barely showed a sign of difference from the beginning of the series, with a few exceptions. However, I will say that the relationships between the characters were definitely some of the more enjoyable aspects of the series, and were all generally handled well. The animation of Mekakucity Actors is adequate, to say the least. As expected of SHAFT, each episode contains an abundance of head tilts from each character. The character designs themselves were quite simple, and there were moments throughout the series where the animation was stiff and much too crudely drawn, almost as if the animators were rushed for time and couldn't be bothered animating the scene with care. Albeit there were moments of fluid animation and some scenes were accompanied with well-animated, colourful backgrounds, but the animation was generally average and below SHAFT's usual standards. Also, I should also mention the animation present in episode 10, i.e. The Worst Use of CGI I Have Ever Seen. A small segment of this episode is cheap CGI animation used to accompany the song which the episode is named after: Ayano's Theory of Happiness. They somehow manage to make what was supposed to be an emotional song into an excruciating 3-minute watch. Definitely the highlight of the series. As expected from a show based of a song series, the music is sublime. Each episode contains the song that the episode itself is based of, redone by an actual singer. As a person who is not particularly a fan of vocaloid, I found listening to each song thoroughly enjoyable. The background music accompanied the scenes well, and both opening and ending are a pleasure to listen to. The opening especially, as it made you ecstatic to see what would transpire in the episode to follow. Despite the flaws present in the show, I couldn't help but find myself excited each week when watching the show. There were moments where the story was portrayed well, well-executed emotional scenes and the interaction between the characters was enthralling to watch. Despite this, there is no doubting that this show has some serious flaws, and the final episode was far too rushed and sloppy in areas. The writers attempted to tie in all of the unresolved elements and it resulted a rushed and inconsistent episode. The rest of the Kagerou Project franchise, i.e. the songs, manga, and novels, is much better than the anime. People probably have many preconceptions about the rest of franchise due to the result of the anime, but the manga and light novels are completely separate from the anime in that they follow their own routes. They're much less convoluted and the storytelling is straightforward and easy enough to understand while also being compelling and having its fair share of twists and turns. The characters are explored more in-depth and are better developed than in the anime, making the read that more enthralling. If you found the fundamentals of Mekakucity Actors interesting enough, I would highly recommend the rest of Kagepro franchise. If you’re familiar with shaft anime, Mekakucity fits into their portfolio perfectly, but that’s not to say the anime is perfect. If you’re unfamiliar with Shaft anime, it’s an experience very different to any other anime producer, and it’s very important to bear that in mind. I’m focusing on some of the flaws the show has in this review, but I enjoyed the show as much as I did some of the Monogatari series, and I’m very pleased to be able to say that. Regardless of your opinion on the director, Akiyuki Shinbou’s, polarising style, he has stayed true to it and to the source material, inviting viewers into the faithfully recreated Kagerou daze world. Unlike a lot of anime, Mekakucity’s plot is not character-driven. The characters are actually a product of the story, and the behaviour of the characters is defined by the direction of the plot. It’s an abnormal approach to storytelling, and has its drawbacks. Many of the characters as a result are left woefully underdeveloped when a new character is introduced to fit in as many fan favourites as possible, and to help push the story along. However, what it does means is that there is a large variety of personalities put on display, so you’ll likely find that perfect one. Finding a character you really like, even despite having a few flaws is not hard when they’re all so likeable! The show spends roughly an episode for each of the character arcs, these mini-storylines tying in roughly with the stories of the actual songs. It’s disappointing to say this, but old and new fans won’t be on an equal footing in Mekakucity. The stories are conveyed well enough though to give newer fans fun and hopefully an interest in the original songs behind the series. The way the characters, and their backstories, neatly link together is a convenient excuse to fit the series into 13 episodes, but they fit together very well. In the grand scheme of things, each character’s mini-arc does contribute to the pacing of the overarching plot, about the story of the monster who gives all the characters their supernatural powers. It’s a convoluted story and full of flashbacks, but pay attention and things will fall together, I guarantee it. What Mekakucity does do, as a result of its roundabout approach to storytelling, is repeatedly twist your perception of the main characters. The show’s big ‘mystery’, where you have to guess which character is actually the one holding the witch’s power, is one that takes a while to become obvious. Inevitably though, Mekakucity’s short running time means that as the pace picks up, useful details are conspicuously left out. Time is probably what this anime needed mostly, but it makes do with its restrictions admirably, and the general tale is satisfactorily wrapped up by the end of the 13th episode. The ending is definitely inconclusive due to time limitations, but also I would like to think by design. Rather like Madoka Magica’s ending there’s a level of hopefulness in the ending thanks to its lack of conclusiveness. Despite its rather convoluted, serious storyline, Mekakucity does not forget the importance of simple fun. On a more positive note, this is where the show really thrives. On their own, the characters don’t stand up very well. It’s an inherent weakness of having to flesh out characters only introduced through a 3-4 minute song. But this is more than made up for though by the ways the characters are able to interact, playing off each other and enjoying the company of people who have powers like them. And probably enjoying their awesome hoodies as well. Seriously, where do I get one? Anyway, if anything the characters add to the eccentric but fun personality that the show has, what with its distinctive music and art style. Onto one of the most important features for the original fans: The music. Quite simply, all the music that started the series is there, and it’s really good. Rather than shoehorn them in at the end or beginning, the songs are used in their original purpose: to tell a story. The songs become a natural part of the storytelling, when they could so easily have just been placed in to please the long-standing fans. For the voice acting, the cast of wacky characters have suitably colourful voice actors. The seiyuu of Mekakucity Actors bring so much more into the story, really justifying the anime adaptation, and special mention goes to Ene’s seiyuu Kana Asumi – her character never fails to bring a smile to your face! On the Shaft artstyle, it really is put to full effect in Mekakucity Actors, for better or for worse. As much as I empathise with the people who hate the largely abstract artwork Shaft have made their own, it can’t be said that Shaft did a bad job here. The surreal geometrically impossible scenery is not a style that will immediately make sense or click, because it seems so unnecessary and pretentious even at times. But even if you don’t love it, there’s excellent use of colour and a particularly heavy emphasis on chiaroscuro, a strong contrast between light and dark. It’s beautiful, and helps covers up some of the inconsistencies in the art itself. Mekakucity is a polarising anime, and not without its fair share of flaws. What is important to me is that, even off the back off Shaft’s work on Hanamonogatari, Mekakucity Actors comes off as one of the most refreshing and original anime series I’ve recently watched. Yes, I wish it were longer and able to give all the characters the time they deserved. I still consider it a very enjoyable and memorable anime that I recommend to fans of Shaft and Kagerou Daze. I would also definitely say fans of modern-fantasy anime looking for something a little bit different should check it out. Mekakucity Actors is a fine introduction to the wacky world of Shaft anime.